In a session extra on TVW’s The Impact, Sen. Jeannie Darneille advocates for the need to improve our state’s mental health system. "I first came to know Booth when he was the Pierce County executive. I remember studying a management book which focused on management by walking around. Booth actively lived by this philosophy – if he was driving his car and saw someone filling a pothole, he’d stop and talk to them. He was always very animated, personable and genuinely interested in what people had to say. "Booth took this approach and philosophy to the governor’s office. When he’d show up at a meeting or at one of our state agencies, he was not there to find out what was bad, but to find out how he could help make it better. "He never fit into any molds – Booth did things his own way. He recognized the importance of investments in our students and in early childhood education decades before anyone else even considered it. He was also an advocate of expanding critical social services and health reform. His voice on behalf of all Washingtonians will be greatly missed." On Wednesday, we reached the halfway mark of this Legislative session. I am disappointed at the number of great policies and bills that didn’t get past the cutoff. As a Democratic caucus, we tried to open up dialogue and create reasonable policies around gun safety, mental health and protecting vulnerable families – however, the Republican majority disagreed. I will continue to advocate for women, children and the vulnerable as we move forward with the budget and move to the second half of the session. I encourage you to visit your 27th District delegation at a town hall meeting tomorrow, Saturday, March 16, from 10 a.m. to noon at the Jason Lee Middle School Cafeteria. We’re eager to hear your questions, comments and suggestions so that we may continue to serve you, help our state recover and emerge better and stronger. If you intend to speak, please arrive early to sign in. Sign-in and information booths open at 9:30 a.m.
We are pleased to be hosting Walgreens Mobile Health—a service provided to community events with health screenings and information. We will also have a representative from Pierce County Aging and Disability Resource Services to provide information at the town hall. The Washington State Department of Ecology’s “Yard Program” will begin sampling and cleaning up residential yards in some of the most contaminated areas of the Tacoma Smelter Plume — Ruston, west Tacoma and southern Vashon-Maury Island. For more information to see if your yard may participate in the program, please visit the Tacoma Smelter plume website: http://www.ecy.wa.gov/programs/tcp/sites_brochure/tacoma_smelter/2011/ts-hp.htm. There you will find separate fact sheets for the different regions the program serves, and a Frequently Asked Questions sheet.If you have comments or questions, please contact Amy Hargrove at Amy.Hargrove@ecy.wa.gov or 360-407-6262. I look forward to seeing you tomorrow at our town hall meeting. If you are unable to make it, please continue to contact my office either by phone 360-786-7652 or email me at Jeannie.Darneille@leg.wa.gov with any questions or concerns you may have. I look forward to hearing from you. 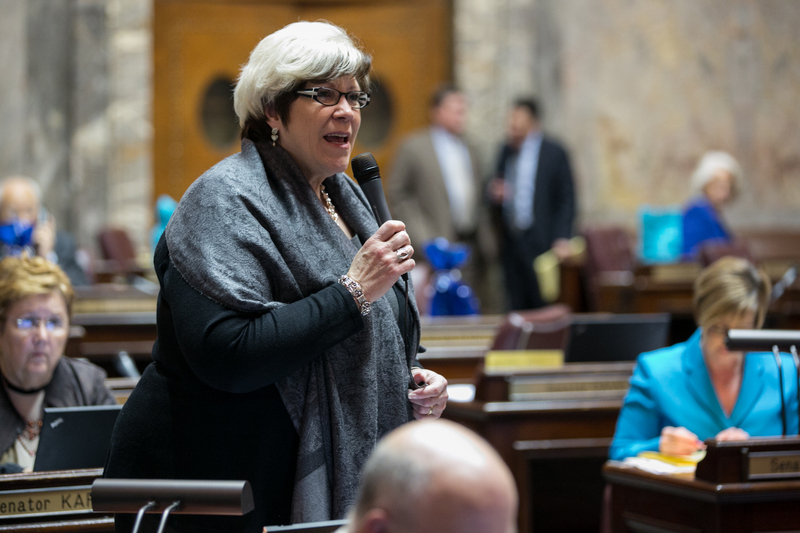 Following the Washington State Senate floor deadline, Sen. Jeannie Darneille spoke about her first session in the Senate. Today, members of the Republican-dominated majority caucus voted to block a bill sponsored by Sen. Nathan Schlicher from coming to the floor for debate and a vote. Senate Bill 5592 would have sought to keep toll increases and operating costs on the Tacoma Narrows Bridge in check by limiting the amount of toll revenues spent on administration and oversight. This bill would have helped residents and commuters to the Kitsap Peninsula who have long shouldered the rising costs of bridge tolls. This bill would have helped our state’s tourism industry, which suffers when tolls rise. It would have encouraged efficiency in bridge operations at a time when LEAN management is needed. This bill passed out of the Senate Transportation Committee on a near-unanimous, bipartisan vote and passed out of the Senate Rules Committee last week. Yet for days, Republican leadership has refused to bring the bill to the floor in advance of a critical legislative cutoff deadline. In response to the failure to act, Senate Democrats forced Republicans to show their hand and take a vote to bring the bill to the floor. As a result of this attempt, all 25 members of the Republican-dominated Majority Coalition Caucus voted against bringing the bill to the floor. Sen. Curtis King, Sen. Joe Fain, Sen. Don Benton, Sen. Sharon Brown, Sen. Doug Erickson, Sen. Mike Carrell, Sen. Steve Litzow, and Sen. Tim Sheldon — are all members of the Senate Transportation Committee who had voted to support the bill before flip-flopping today and voting against it. Also included in the parade of “no” votes was Sen. Rodney Tom, the architect of the self-proclaimed “bipartisan and collaborative” Senate Majority Coalition Caucus. A coalition that claimed it was all about building bridges across the aisle. Instead, by their actions today they have shown that delaying legislation which would manage the cost of bridge tolls is apparently more important than working to lessen the burden on our working families. Why? Why would these members vote against a bill they had supported just days ago? Why would they vote against putting it to a vote on the floor of the Washington State Senate? Perhaps their constituents and those who drive across the bridge should ask them.